Can I say a big thank you to each of you for the supportive comments made over the past few days. It's more than a mere platitude when I say it means a lot to me. On NewstalkZB today after 11 discussing, among other things, the election. This is around the sixth show I've participated in. Initially I was petrified. But now I really enjoy them. Going into the studio the first time my expectations were framed around the National Radio experience which is a disembodying one, led from one rabbit-warren space to another with minimum communication. The staff at NewstalkZB by way of contrast are very friendly, the studio has widows which lookout over Taranaki street and you get to take a breather during the ad breaks. The superiority of the market yet again! There is discussion around the blogs about ACT's list announcement today. No, I am not the mystery number 5 person. I don't play games. In 2005 I was ranked 9. This was a strong placing given ACT had nine MPs with two retiring. It was a vote of confidence in my abilities and suitability to be ACT MP. This year, with only two MPs, I was offered a rank of 14. Something has changed and it isn't my performance or philosophy. I've continued to build a profile as a welfare commentator, securing regular interviews and a regular spot on a well-rating Wellington radio show. I've supported ACT positions at select committee level and continued to increase my knowledge of parliamentary process. In the Hutt South electorate our steady fund-raising has continued to build one of the strongest electorate campaign funds. Whenever asked to deliver material or represent ACT I have obliged. Our electorate support has remained healthy as evidenced by my Petone Working Men's Club launch in July which sold out. I have the continuing endorsement of two high profile New Zealanders - Sir Bob Jones and Michael Bassett. More could be said but I return to my main point. Whatever ACT wants has changed. What that is, is no longer clear to me, so I wouldn't accept a place on the list. This is pretty much the guts of what I told Rodney in an e-mail by way of explanation. Nobody has a right to be published. That's why blogs are so powerful. Because they can carry information to many people when other media decline to. After National's welfare policy release, a number of pieces of information were bandied about by journalists and academics that were just wrong. I rebutted some claims made by academic researcher, Christine Todd, like most single parents on welfare are Pakeha, here. On Monday Dominion Post writer Linley Boniface was citing the researcher's 'illuminating article'. I duly sent the letter below pointing out the problem with Boniface's assertions and already it has been rejected. The rejection isn't unusual but the speed of it is. Generally the Dominion Post sits on a letter for 2-3 weeks before rejecting it. Linley Boniface uses 'facts' to back her defence of single parents saying less than 4,000 of those parents with children aged over six have been on the DPB for more than 10 years. Actually, nobody knows how long people are staying on DPB. The Ministry only records continuous spells and many cycle on and off it. Academic, Bob Gregory, discovered Australian single parents were spending an average total time of twelve years reliant on welfare. A single parent on the DPB gets $263.78 she writes. This ignores family support and accommodation supplement. The average weekly income is over $400 per week. 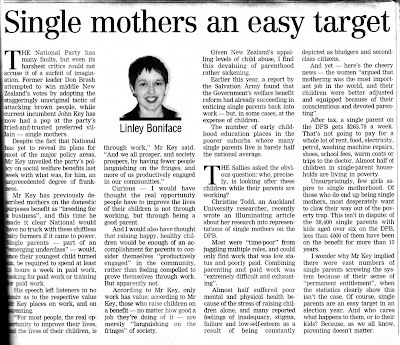 Finally Ms Boniface believes that expecting single parents to work is "devaluing parenthood", which is "sickening ...given New Zealand's appalling level of child abuse." Yet the incidence of child neglect and abuse is higher amongst beneficiary families. 1990s research showed children in DPB homes were four times more likely to be the subject of a notification to Child, Youth and Family. Child abuse has long been associated with (not exclusively of course) ex-nuptial births to very young Maori mothers. Life-style welfare is contributing to the growth in social problems. It is not improving the life prospects of children. One of the reasons more people are recorded as having no religion is the increase in the Asian population. The drop in Christianity is quite rapid. It isn't being transmitted intergenerationally. I have always talked to my children about living by a philosophy akin to Christianity. Treat others as you would have them treat you and tolerance. To me these values are derived from reason. Not religion. I was christened a Methodist and went to church and Sunday School as a child (and remain convinced Sunday School existed for parents to have some nookie though I have no evidence). But my generation was a questioning one. Religious belief seemed fraught with problems to me so I just stopped bothering. Neither of my children are christened. That was a deliberate decision because I am offended by the idea that children are born into sin. What balderdash. David has taken them to church on occasion but neither have found the experience so instructive and pleasurable that they desperately want to repeat it. Interestingly though my 9 year-old has recently been talking about believing in God but "just not God the Creator". So perhaps she will take after her father. Religion in our house is as it should be anywhere. A matter of personal faith, and respect for such, rather than a source of division. Shared values are far more important.